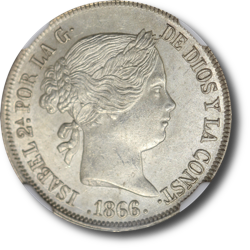 However, Spain's many revisions of its coinage continually failed to prevent export of its silver coins. 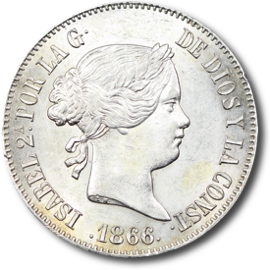 Despite reducing the purity and weight in 1848 and again in 1854 the silver 20 reales coins still contained more silver than the 25 gram French 5 francs which were used interchangeably in commerce. Enterprising persons could exchange French 5 franc coins or 100 reales gold coins for an equal face value of Spanish 20 reales silver coins and make a profit simply by moving them from one place to another. All the better if the current gold to silver exchange ratio was favorable. Repeating the process several times was quite lucrative. However, it was devastating to Spain's limited supply of silver and to routine commerce. Average citizens of Spain were left with fewer and fewer coins with which to conduct daily business. Since very little paper money was issued by Spanish banks relative to the supply of coin, what coins remained were used to exhaustion. And despite efforts of Spanish government to ban foreign coins, the coins of France and other countries continued to circulate in Spain. By 1864 officials from several countries in Europe were meeting to discuss standardization of coinage to facilitate trade and combat the problems of having different gold to silver exchange ratios. The Latin Monetary Union was formed in 1865 among France, Belgium, Italy, and Switzerland. It standardized the exchange ratio of gold to silver and established coin specifications based on the existing French coins. Based on this, the correct weight of a 5 franc or 20 reales coin to make them directly interchangeable would be 25.0g at 0.900 fine yielding 22.5g of pure silver. 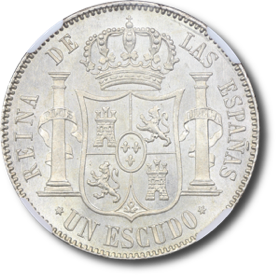 A royal decree of 26 June 1864 introduced the escudo as the primary monetary unit of Spain and began the Third Decimal period. This was the perfect opportunity to again revise the specifications of Spain's silver duro to match the specifications of the French 5 franc, thus preventing export of these large silver coins. Sadly, that did not occur. 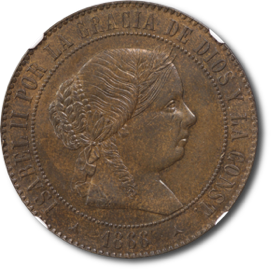 The decree was the first in Spain to specify coin weights in grams rather than "marco". 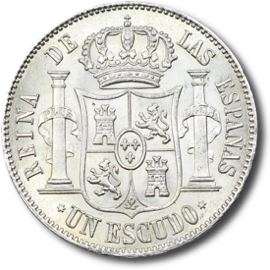 It slightly reduced the weight of the 1 escudo (which replaced the 10 reales) and reduced the purity of smaller silver coins. 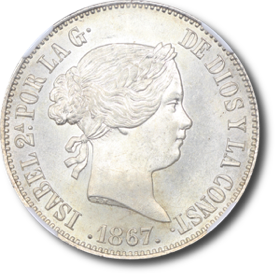 However, the silver 2 escudos replaced the 20 reales at…exactly the same purity and weight as before. As a result, the 2 escudos and 1 escudo coins continued to be exported. 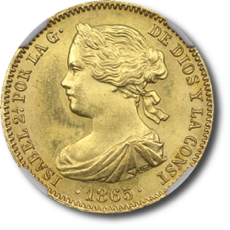 Isabel II 5 céntimos were struck from 1865 through 1868 of one type and two major varieties. The first variety without the initials "OM" on the reverse beneath the oval and the second variety with the "OM" mark. Both varieties were struck by Oeschger Mesdach & Co., but early issues lacked the "OM" marking. 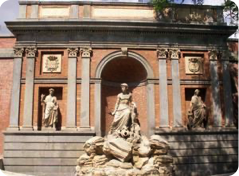 To augment Spain's existing mint production, the government of Spain contracted with Oeschger Mesdach & Co. 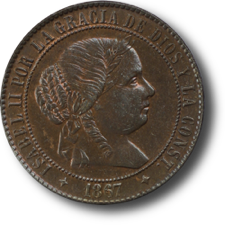 Representatives of this company took up residence at existing Spanish mint facilities and were responsible for striking the bronze issues during the 3rd decimal period. The coin pictured above is of the variety "with OM". The three pointed stars on either side of the date identifies the Segovia mint. This coin is well struck, with attractive mottled toning on the obverse and reverse, and luster throughout. 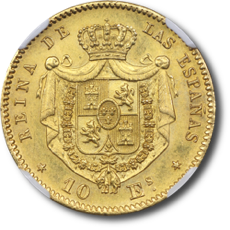 The 10 escudo was issued from 1865 to 1868. The coin pictured above has relatively few marks and mint fresh luster throughout. The portrait of Isabel II is beautifully accentuated by frosty luster over most of her face and hair. Similarly bold luster and frosty devices appear on the reverse. The finest example of this date seen by this author. As the French 5 franc had been a 25.0 gram 0.900 fine coin for decades the Spanish government's repeated failure to match the 20 reales coin to the weight and purity of the 5 franc is puzzling. The Spanish silver duro had been the world standard for so long that one wonders if something as simple as national pride may have continually prevented Spanish ministers from taking the more logical course of action. 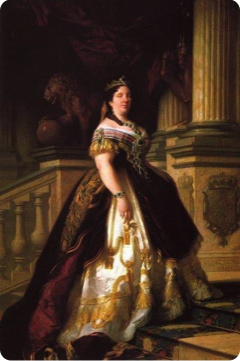 After the revolution of 1868 and Isabel's departure for France a provisional government was formed that would soon revise the coinage system again. This new coinage system would establish the peseta as the standard unit of account. Five pesetas was equivalent to 2 escudos and the new 5 peseta coins were finally made equal in weight and purity to the French 5 franc coins. 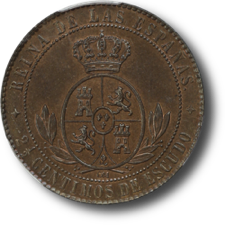 The 1 escudo was issued from 1865 to 1868. 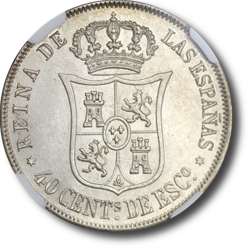 This coin is identical in appearance to the 10 reales coin that it replaced, save for the denomination on the reverse. The example pictured above has lustrous surfaces with tinges of golden toning and a few light marks. The coin pictured above has considerable luster on the obverse with subtle toning at the base of the bust and around the date. The reverse has a few light marks and is fully lustrous with almost no marks. The finest example of this date seen by this author. In the late 1850's and early 1860's an influx of foreign investment combined with Spanish military victories in northern Africa dramatically improved the morale of Spain. Nationalism and prosperity were on the rise. 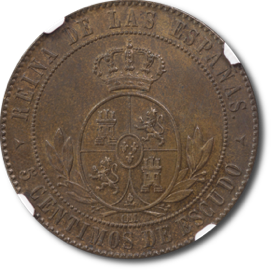 The 40 céntimos de escudo was issued from 1864 to 1868. It had a value in the range of common purchases while having a lower silver content than the larger silver coins being exported at this time. As such, this was the workhorse silver coin of its day. Most are encountered heavily worn or damaged. Problem free examples above XF are extremely difficult to find. The example pictured above has lustrous surfaces with hints of champagne toning and a few light marks. A beautiful example of the type.